White Rock Volunteers Help Out: 9.12.14. The Friends of White Rock who are busy renovating the Smith’s Canal near the Llandore Park and Ride (the site of the old White Rock Copper Works) were our guests this Tuesday. The FOWR were only inaugurated in September this year but they are making great headway in restoring the 300m of what remains of the Smith’s Canal. 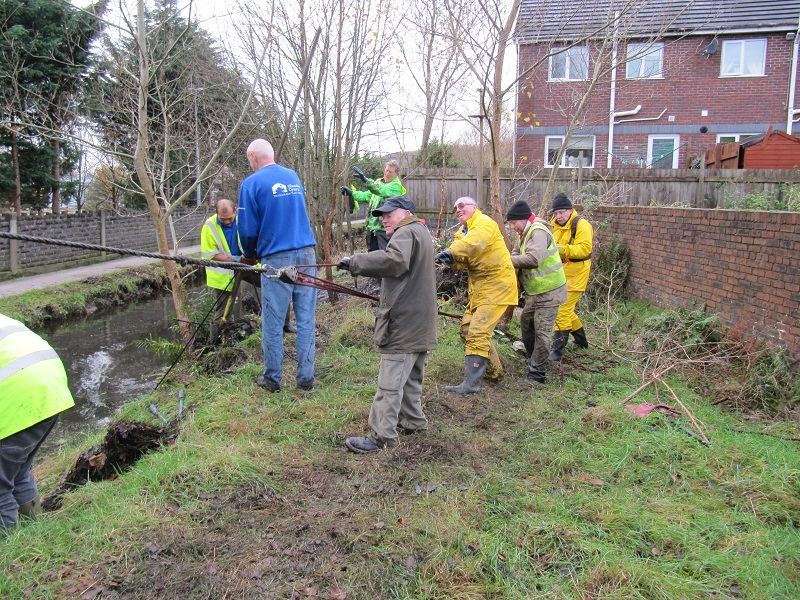 We all pitched in close to Clydach Lock to pull out the rooted goat willows in the canal with winch and pulley and the ever present Canadian Pond Weed by drag fork and rake. The extra hands were most welcome. John, Tudor and Janet from the FOWR also brought with them two students from Lyon, France. Sara is doing a paper for her degree on Post-Industrial Reclamation and is using both the canals in St.Etienne and the copper works in Swansea as examples of this kind of restoration. Both she and her friend Juandonil were very enthusiastic in their use of the rakes and got extremely wet. As they had to make a return train journey to Cardiff we do hope their lasting memories of the Swansea Canal are not of the onset of Trench Foot or influenza. We thank them all for joining us and we plan to make a return visit to the Smith’s Canal on December the 19th. Previous postCIWM Clean Britain Awards 2014 Next postTHE WEEK AHEAD: 14th Dec. to 20th Dec.